I am writing regarding the November 7, 2018 Public Works and Health Committee meeting. I was disappointed and pretty much aghast at the response from Council Members to the request from the Public Health Advisory Board (PHAB) for support from the Council for our immigrant families in Whatcom County. I don’t understand the apparent refusal to be informed by the board of the needs of immigrant community members. It seems to me that perhaps practiced disregard of the suffering of immigrant community members has caused Council Members to not seriously consider the request for support made by the PHAB. 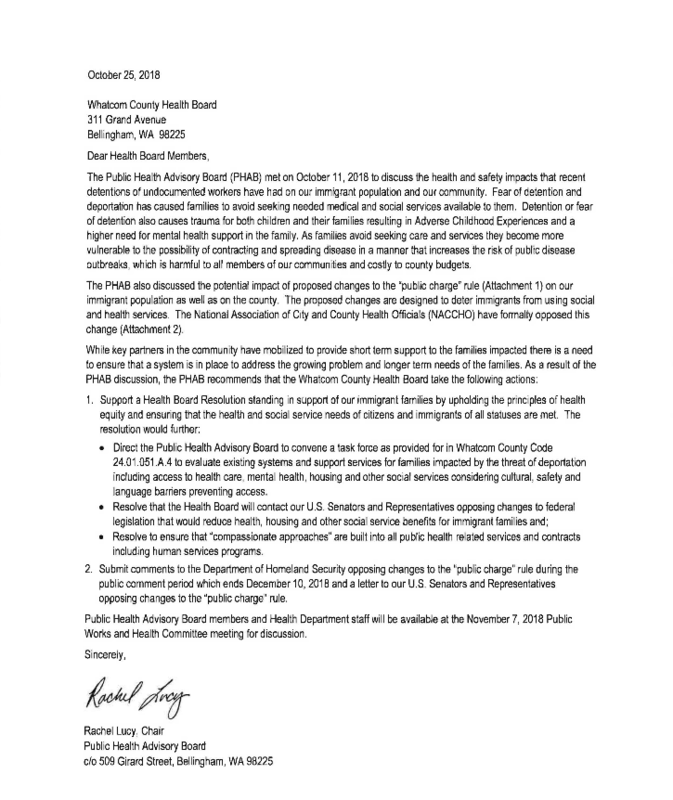 Obviously, in reading the letter from PHAB Chair Rachel Lucy, that request for support focused noticeably on health and safety impacts experienced by community members caused by detentions and deportations of undocumented workers. Also, last year at the same Whatcom County Council meeting, Council Member Brenner had implied that since she is friends with many immigrants in the county and doesn’t ask about their status and doesn’t care about that, and folks are often referred to her and call her, that she would be surprised to learn that members of the community were experiencing any kinds of negative impacts that would result in reluctance to report mistreatment of any kind. Meanwhile at the Wednesday Public Works meeting Council Member Brenner said that if immigrants are not here legally, she is not in support of them. So, to me this shows how the people who work in our government agencies can, on one hand, view themselves as welcoming and approachable, and on the other hand, can be giving out signals that there are thousands of people in our community who do not have their support and who, therefore cannot rely on leadership, health authorities, and law enforcement not to turn them away, or worse, when they seek assistance. This escalates the climate of fear and intimidation created by increased targeting of immigrants in our country and here in our county, and presents many dangerous challenges to the physical, mental, and economic health of our communities. I am calling on Council Members to rise above their apparent initial indifference to the PHAB request for Council support and to contact the board to have them make a presentation to the Council based on PHAB outreach to community members and board expertise. Their hard work on this issue, and our friends and neighbors who live in fear of deportation every day – some who don’t have documented citizenship, some who may be their family members, and others who may have legal citizenship but still suffer harassment or intimidation due to government scrutiny of immigrants – definitely deserve more than three minutes of Council committee time. This entry was posted in Commentary, Information, Letter and tagged Barbara Brenner, Barry Buchanan, Human Rights, Immigrants Rights, Immigration, Public Charge, Public Health Advisory Board, Rachel Lucy, Racial Justice, Racism, Social justice, Tim Ballew II, Whatcom County, Whatcom County Council, Whatcom Health Board. Bookmark the permalink.